In the current environmental, political and economic context it is clear that the energy efficiency of agriculture will become increasingly important. Similarly greenhouse gas emissions from agriculture will need to be minimised. Nitrogen fertiliser is a major energy demand in agriculture and its production, transport and use are major contributors to N2O emissions. Crop diversification and lowering inputs are major drivers for sustainable agricultural policy. Pulse crops can contribute positively to these two policy goals because, as a consequence of biological nitrogen fixation, they require minimal inputs while acting as a very effective break crop in a cereal dominated rotation. Pulse crops therefore minimise the negative impact of both the application of nitrogen fertiliser and its production, through reducing the demand for nitrogen fertiliser for pulse and subsequent crops. To achieve the benefits of pulse crops, legumes need to fit within farmers’ economic model. A major cause of their limited contribution is farmers’ perception that these crops have erratic performance and that their end product value is variable. Yield potential of pulse crops is high but average yields are about half of the best achieved, and even the best UK yields fall short of their potential by about 25%. There are many causes for this, but efforts to improve yield consistency through genetics and breeding have the potential to achieve an increase in pulse production in the UK. Thus there is a need to make legume crops more attractive to farmers, and to increase the market value of their product. These two are the major strands of PCGIN activity. The first is being addressed through the improvement of crop performance and reliability, by establishing the genetic basis for agronomic traits such as standing ability, yield and disease. This will address the major problems in growing pulse crops, as defined by breeders and growers. Yield per se is a complex trait which, aside from the components attributable to plant architecture and disease, is likely to be genetically determined. Although commercial lines having greater resistance to lodging are available now for pea, there are no reliable genetic markers associated with this trait and the genetic complexity of the trait is not understood. Although genetic resistance markers have been defined for powdery mildew in pea, none has been described for downy mildew, a fungus that has a large impact in diminishing yield in pea and in faba bean. 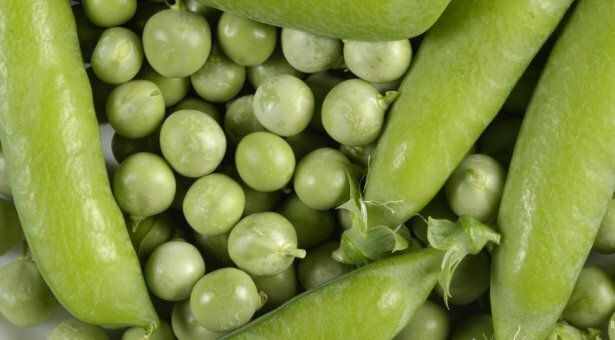 Additional disease problems exist for both pea and bean, although not all of these are a problem within the UK. Pulse crops are also an efficient source of plant-derived protein for food and animal feed. Increasing the market value of seed products will depend on genetic studies that define and underpin the traits that limit quality. For the high premium export markets available to pulse growers in the UK, visual traits are extremely important as quality determinants. Of these, colour stability can determine whether seeds reach export grade or are classified as lower value feed. For animal feed, improved digestibility of seed components is an important goal in minimising eutrophicating waste, while improving animal performance. In faba bean, a major problem affecting quality (and yield) has been posed by bruchid beetle attack in recent years. This and additional problems in faba bean have highlighted the need for basic genetic toolkit development in this species. This will be based on detailed phenotypic analysis under field conditions of pea populations segregating for economically important breeder priority traits. A minimum of three traits will relate to plant agronomy, while seed quality traits will be scored in the crosses involving vining and marrowfat parents. Linking these traits to genetic maps as quantitative trait loci with adjacent marker and primer information will provide tools directly to breeding programmes. The outputs will have application to related pulse species, where markers may be transferred in consultation with stakeholders.